This entry was posted in Local Support?, news & press, punditry/viewpoint, Schenectady Casino and tagged Location Board, NYS Gaming Facility Location Board, Schenectady Casino, Schenectady Gazette by David Giacalone. Bookmark the permalink. You people are craxy. What waterfront the waterfront that is unused? The waterfront where I have seen homeless people tent up. The waterfront the used to build locomotives there. 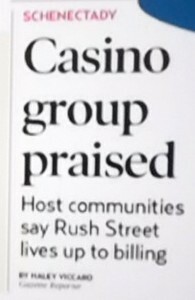 How about where a casino will maintain the waterfront, where the casino will beautify it, where there will be usable space (not for homeless) when you write an article don’t make stuff up either or bring out a map and learn geography. Pc is on Mott and Erie not nott and maxon as they don’t intersect. And you call that essentially a skinny area how ever the aformentioned maxon is exactly acroas the street from the proposed casino there negating half of what was said. And if a casino doesn’t go there apartments were planned which would not maintain the waterfront. Thanks for adding your perspective to our site. 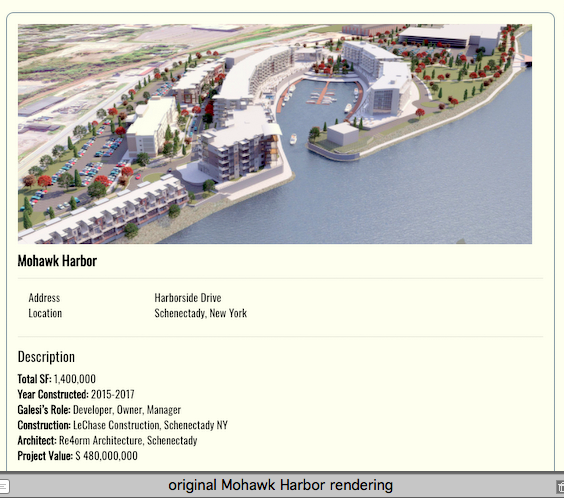 Galesi Group planned to build a mixed-use development at Mohawk Harbor, whether or not there was a Casino, and to do all the needed remediation on the whole site, too. They would have fixed up the rest of the 60 acres (maybe with a park and trails) and looked for other uses for the east half of the parcel. We did not need a casino for the full 60 acres to be spruced up. 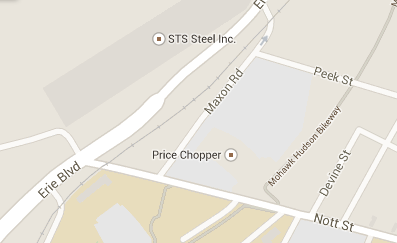 By the way, I did a quick check of a map, and as you can see if you click that link, the Price Chopper/Golub Building is at the corner of Nott St. and Maxon Rd., a block south of Erie Blvd.